advocacy group, in Washington, D.C.
On the surface, this sounds reasonable. From documents a colleague and I obtained through a Freedom of Information Act request, I calculated that between 2011 and 2016 the NIH funded 25 percent of ME/CFS grant applications, a higher acceptance rate than the average for all grants. It seems obvious, then, that more applications would yield more funding. 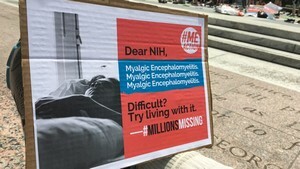 But it’s not that simple: Despite growing interest in ME/CFS, NIH grant applications to study the disease have dwindled since 2015. Why? The NIH has erected an obstacle course for those wanting to do research on this disease. I see at least five obstacles that scientists must navigate on the path to funding.